Peter Eötvös evidently wants us to hear his music as the continuation of a grand Hungarian tradition, in which he is only two steps removed from the country’s greatest ever composer. This album makes the case, and without over-emphasizing the connections. The individuality of each composer is just as evident as their similarities, and the connections themselves are subtle. The portamento-based sliding textures, for example, in the Eötvös concerto, when heard in any other context may seem like a legacy from electronic music, but when placed directly after Bartók’s Second, there is a clear link with the earlier composer’s trombone glissandos. There’s Bartók in the Ligeti too, or rather, there’s Ligeti in the Bartók; the strident woodwind chords in Bartók’s second movement sound surprisingly similar to Ligeti’s ocarinas and distuned horns. But this narrative is merely a subplot to the album as a whole, and despite the fact that one of the featured composers stands at the podium, it is the soloist who dominates proceedings. Patricia Kopatchinskaja has a distinctive voice as a violinist, with both her style and her technique marrying Eastern European gypsy music with Central European classical traditions. She is drawn to classical works that include folk elements, and by emphasizing their earthy textures and infectious rhythms, she is able to rescue them from both the formality and the arbitrary sophistication of the concert hall. The distinctive flavor of Kopatchinskaja’s playing is most clearly evident in the Bartók, where comparison with the already burgeoning catalogue demonstrates just how different her approach is. Kopatchinskaja’s tone is focused and vibrant. It has a kind of neon aura that could almost suggest electronic manipulation of the sound. The cult (or myth?) of naturalness that pervades the classical recording industry means that this sort of sound is all but unheard in the concerto repertoire. As a result, her timbre alone makes Kopatchinskaja sound like an import from the folk world. Something has to give, of course, and while Kopatchinskaja gives an intensely musical reading of the Bartók, many will find it lacking in a number of respects. Kopatchinskaja’s sound is either on or off: she can play quietly, but even then she dominates proceedings. And the quieter passages, especially in the first movement, don’t have that urbane late-Romantic sensibility that most violinists find there. The pay-off is in the loud and propulsive music, and here Kopatchinskaja comes into her own, dropping all pretentions to classical respectability and going back to her roots as a folk fiddler, roots Bartók himself would surely have recognized. The Eötvös concerto is entitled Seven and was written in memory of the seven astronauts who died in the Columbia space shuttle disaster in 2003. Not that it is a particularly mournful piece. The emotional profile of the work balances the enthusiasm and excitement of space exploration with this significant reminder of its dangers. So the music is full of invention and sonic exploration, but is continually reined back to a human scale, not least by the focus on the soloist within the large ensemble. (In fact, seven ensembles are used, spaced judiciously around the hall—there’s certainly a case here for a surround sound recording.) The most radical aspect of the concerto is its form: four accompanied cadenzas, each more substantial than the last, and culminating in finale proper. The work was not written for Kopatchinskaja (it was premiered by Akiko Suwanai) but her insistent and incisive tone works to the benefit of the complex textures. Eötvös lets his imagination run free in his use of the orchestra, but there is never any danger of the soloist getting lost in the sound. Her playfulness is also an asset here, and when Eötvös’s score begins to sound too intellectual for its own good, the vibrant musicality of the soloist always ensures a sense of immediacy and emotional engagement. 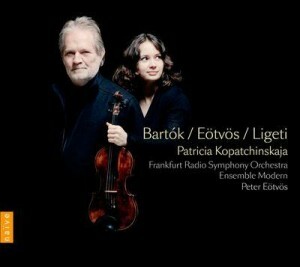 Ligeti’s Violin Concerto is possibly the ideal vehicle for Patricia Kopatchinskaja’s unique approach. Elsewhere she seems to be continually fighting against classicized and normative models of Eastern European folk music within the established canon—even in the Bartók. But Ligeti speaks her language. Ligeti’s late music relies heavily on intractable sound complexes, and on mind games of order and chaos. But both are motivated by a desire to get back to his Eastern roots, to short-circuit the sophisticated mechanisms of new music and reveal beneath them the more astringent and primal sounds from which all music originally grew. And there is no violinist better suited to this paradigm than Kopatchinskaja. Comparisons between her reading and those already available—Saschko Gawriloff, Christina Åstrand, Frank Peter Zimmermann—shows that the qualities she brings to the work are similar to those we find in the Bartók. Her focused ever-present tone prevents the opening appearing out of nothing. And the solo line always dominates, even on the rare occasions when it shouldn’t. But the polyrhythmic complexity of the solo writing is clearer and more engaging here than on any previous recording. And, most importantly, there is never any feeling that Kopatchinskaja is trying to civilize this music. She knows exactly where Ligeti is coming from, and like him, she has no intention of rounding off the edges in pursuit of spurious classical elegance. Eötvös the conductor is a sensitive and perceptive accompanist. Twenty years ago, Pierre Boulez would have been the natural, perhaps only, choice for conducting a program like this (he conducted the premiere of the Eötvös and the first recording of the Ligeti). Eötvös has been gradually taking over that role in recent years, and the clarity he brings to the textures, the impeccable orchestral discipline, and the feeling of life and vibrancy in every orchestral passage, show him to be ideally qualified as Boulez’s successor. Great playing too from both the Frankfurt RSO and Ensemble Modern, with both ensembles and soloist recorded in transparent and immediate audio. A triumph, then, for all concerned, and a must-have for anyone interested in the music of Ligeti or Eötvös. Those thinking of buying the set for the Bartók should be warned that Kopatchinskaja’s reading is idiosyncratic and bypasses much of the classical sophistication heard on other recordings. But Kopatchinskaja works only on her own terms, and as with her previous discs, everything here is as distinctive as it is compelling.